Description of "The Mindful Mind"
Harness your True Inner Potential, Reclaim Your Inner Peace & Happiness, Conquer Stress and anxiety and Start Your Journey Towards A Better You. What if you are able to receive deep inner signals for your next best action. What if you are able to handle never-ending outer world demands with deep inner peace and calm. Imagine winning your feeling of overwhelm in the face of any stressful situations. Imagine nurturing best relationship with your loved ones and start living with enhanced awareness. If you are frustrated with all your inner chaos and stress and anxiety, If you continuously wonder why life seems so hard to you always, If you are sincerely looking for the ways to bring joy and happiness in your life, Mindfulness is your answer. In THE MINDFUL MIND, bestselling author Som Bathla has examined the concept of mindfulness from meditation and practical perspective alongwith analysis of its scientifically proven advantages for your body and mind. The Mindful Mind is your tool box to understand why and how mindfulness is an important tool for your overall well-being. You will get to know the right approach to implement mindfulness in your daily life as quickly as from tomorrow. •	How mindfulness is helping the big corporate like Google and also in Government to improve the work performance of its people. •	How mindfulness can literally change the structure of your brain as evidenced by science. 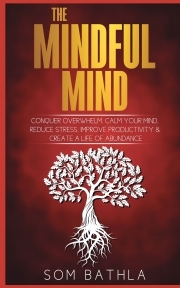 •	The benefits of mindfulness including improving your focus, memory and better decision making and provide you the benefits of mental relaxation. •	How mindfulness can help you to cure your bad habits and even lose your weight by mindful eating. •	The knowledge from the experts on the how you can immediately start your mindfulness practice. •	You will get to know the best mobile apps to incorporate your mindfulness practice anywhere and anytime through guided meditation techniques. Every Mind needs mindfulness because it is the elixir for your mind. So if you are sincerely looking for a newer and better way of leading your life. If you want to see abundance in your life while maintaining your inner peace and happiness, The Mindful Mind is here to help you out start your Journey into your inner world and explore your unlimited mind. As is rightly said "A journey of a thousand miles begins with a single step"
So Don’t sit on the fence and take your first step Now! Som Bathla is a bestselling author of multiple books focussing on providing effective ways for improving productivity, mastering focus, converting negative mindset into thriving one and practical strategies to take massive action towards success. He is convinced about the limitlessness of the human potential and strongly believes that everyone has the potential of achieving more than one thinks about oneself. Som resides in India where he spends most of his time reading, writing and enjoying time with his amazing wife and two sweet daughters. Visit www.sombathla.com to know more about his life changing book cataglogue. Reviews of "The Mindful Mind"